Doug's first post from France was that his bag had been lost in transit. It turns out that it wasn't lost but merely detained in the US by the TSA. Apparently, they decided his hiking stick, compass, life jacket, hiking pants, vang, and various lines looked like elaborate equipment for some sort of sinister plot. So, the careful packing of his compass inside his life jacket was all for naught. The contents of his bag had been turned inside out and his compass was broken in transit. Fair warning to other sailors traveling. It might not be a bad idea to put a brochure of the event you're headed to along with a picture of the boat and its various equipment inside your bag so security can figure out rather quickly what you're up to. After Doug's post we received a very helpful email from Mike with a brilliant suggestion. 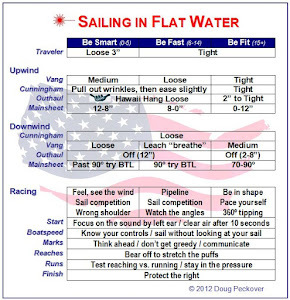 Since there might be other terrorist sailors making their way to France armed with dangerous hiking sticks and compasses, this might come in handy for others whose compasses are lost or broken along the way. The shadow of your mast on the deck can be used as a compass with reasonable accuracy. 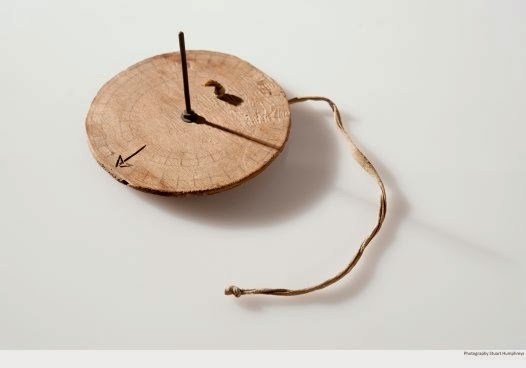 The earth revolves at 15 degrees per hour, so at the equator the shadow of a stick moves at 15 degrees per hour. It is less or more depending on latitude and winter or summer because the vertical angle to the sun is less than 90 degrees. Anyway the important thing is the shadow will only shift 1-2 degrees per leg of a race due to the sun so 5 degrees shifts are detectable. 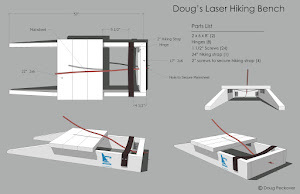 For a Laser, 5 degrees will be 1 ¾” on the deck edge opposite the mast, so that is probably the resolution of measurement. If the shadow reaches the transom it is about 7” per 5 degrees shift. The biggest source of error can be heel angle. If the sun is side-on port tack, the shadow will be opposite the mast with a resolution of about 2” per 5 degrees. However on starboard the shadow will be on the bow or stern with a resolution of ~7” per 5 degrees, but the shadow will move a lot due to heel. Also, on port the shadow will move with pitching, whereas starboard will be insensitive. Anyway I don’t think about it too hard – I just note the positions of the mast shadow when I’m lifted and knocked on both tacks. Thanks Mike! Doug really appreciates you sharing this. For now, I'm posting and commenting for Doug because Blogger keeps translating everything to French. Hopefully, he'll find a workaround for posting his competition notes. I'm pretty sure I read on some amazing blog somewhere that Robert Scheidt has sailed without a compass since 2000. If only Doug was as skilled as Scheidt. He wouldn't be so worried right now about sailing in waves he says are the biggest he's seen in about 8 years. I don't think the compass is going to matter as much as just keeping the mast pointing toward the sky. Thank you. I have now calibrated my Laser with black marks 1 ¾” apart on the side decks and 7" on the transom. I expect dramatically better results. Not sure the sun compass is going to work for Doug right anyway. He says they've had lots and lots and lots of rain. And it sounds as if it is going to be rainy with light winds in Hyeres on Sun, Mon, Tues, the first 3 days of racing, too. 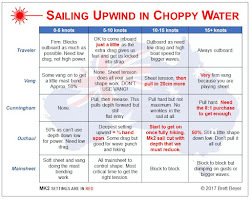 They've just published the SI's and there's a provision to sail on the rest day if the forecast (ie Mistral) gets crazy. Seriously, I have a compass but don't sail with it very often. I feel that at my mediocre skill level there are much more important things to focus on. It's a distraction for sure. I like to take quick glances at it and then look around for the pressure. And of course, compasses tell you exactly the wrong thing (tack on a header) as you approach the windward mark in lighter winds.